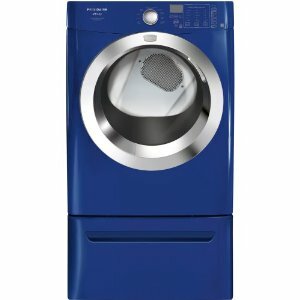 The FASG7073LN is a model of dryers from Frigidaire which mixes ample design with functional features. For one, it boasts of an NSF Certification, since the dryer has 'Sanitize' temperature settings which ensures laundry to be 99.9% bacteria free. With the Frigidaire trademark SilentDesign feature, this dryer model operates in quiet but effective strength. The no-frills, streamlined design is attractive for anyone who wants a practical and beautiful dryer. The dryer's machinery is equipped with an Energy Saver Option, which uses features that reduces the consumption of energy for up to 35 percent. That's a whole lot of savings with the assurance that the quality of drying s not sacrificed. The Ready Steam feature of the dryer uses the drying technique everybody trusts in removing wrinkles and freshening their clothes. This Ultra-Capacity Dryer allows more loads to be dried in one go, which in turn, saves time, energy and money. The DrySense Technology in the machine adds an element of precision on how items are dried, producing effective and wrinkle-free results in anything the machine dries. The large front loading door has a see-though glass that allows users to see what's exactly going on inside the machine while it's in operation. The control panel is neatly arranged on top of the dryer's front face, with only an LED screen, a dial for settings, and a few controls. With not too many controls and buttons, users certainly won't be intimidated. The blue color of this particular model is something rare and unique to it. The Save Your Settings feature of the model saves the last dry setting the user had so that there won't be any need to keep on figuring out what buttons or controls were used in the past. This is certainly time saving! The Anti Static feature of the machine makes finished items look and smell natural and soft. Say goodbye to stiff and burn-smelling items! The Line Dry feature gives users the feel of outdoor-dried clothes, by a machine! This dryer model is equipped with 15 dryer cycles, a number that may prove to be a bit impractical for some users who won't see the use of that many cycles.